See the splendor of the fjords with fewer crowds on this off-season escorted tour of Norway. You’ll arrive in Oslo to begin a 7-day adventure into some of the world’s most beautiful and mysterious landscapes. Start with a guided sightseeing tour of Oslo that features the National Theater—home of Ibsen’s plays, the unique Storting building, which houses the Parliament, as well as the Royal Palace. Stroll through the famed Frogner Park with the remarkable Norwegian sculptures by Gustav Vigeland. Visit the venue of the Nobel Peace Prize ceremony at City Hall. From Oslo, you’ll drive northwest through Hallingdal—a large valley, rich in the traditions of iron production, cattle trade, folk art, music, and dance. You’ll pass through the world’s longest road tunnel to Aurland on your way to the beautiful village of Flåm, situated at the head of Aurlandsfjord. Your stay in Flåm includes a boat ride on the spectacular Naeroyfjord—a UNESCO World Heritage Site. Continue on to Bergen, the “City of Seven Mountains,” where you’ll take a drive to see Bergen us Fortress, Bryggen Hanseatic Wharf, Bergen’s harbor, and the famous fish market. Take a step back in time through the cobblestone streets lined by colorful wooden houses that are quintessentially Norwegian. Celebrate the stunning natural beauty of Norway, its art and cultural history with a delicious dinner. Travel back via train to Oslo through the countryside of Norway. The stunning natural beauty of Norway, and its art and cultural history, will stay with you for years to come! 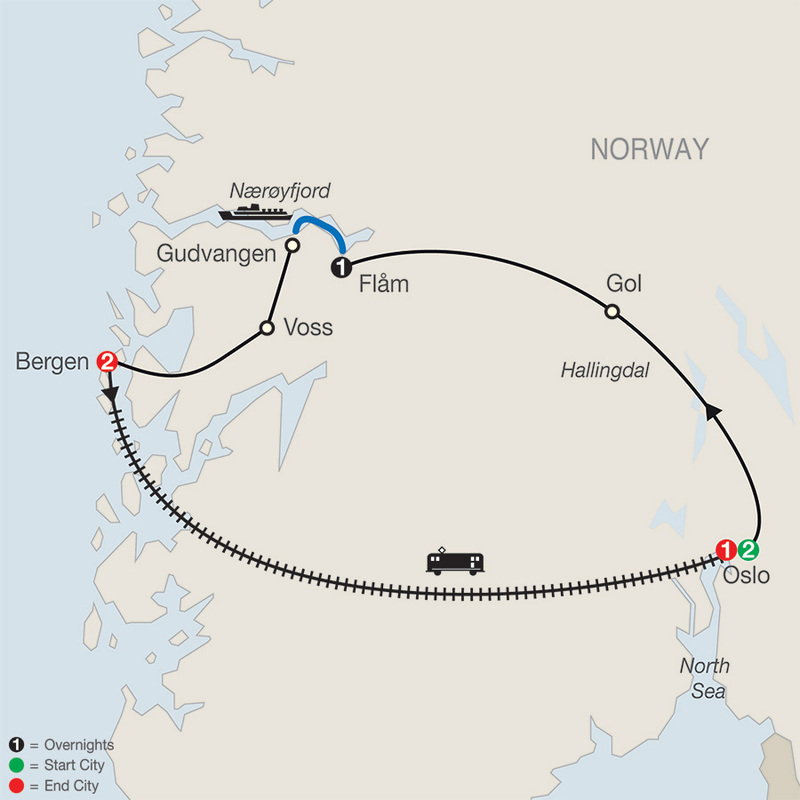 You will be transferred by TRAIN to Oslo (B). Ten-story Hotel located in heart of city, 200 meters from the Parliament. An ultra-contemporary 408-room hotel with playful styling and Free Wi-Fi access throughout. The stylish restaurant serves international cuisine with fabulous views over the Oslo Fjord and opera house and there is a lobby bar and fitness room. The Scandic Ornen is Bergen's newest and largest hotel with 368 spacious, bright and modern rooms. First Hotel Marin is a classic hotel situated very centrally in Bergen. The hotel is located at the famous "Bryggen" in Bergen which is on UNESCO world-heritage list. Marin holds 152 well equipped rooms.